When I read the invitation from Swissotel, just these three words "Balinese Food Festival " were enough to attract me as a foodie and food blogger to reach @ Swissotel for their "Balinese Food Festival" which is going on right now at Cafe Swiss, Swissotel. 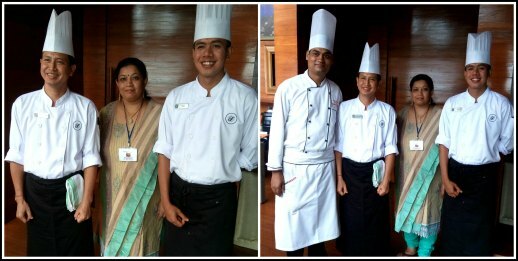 Swissotel has always showcased all sorts of International Cuisines for the people of Kolkata and it's the first time they have brought Balinese Culinary experts Master Chef Sugiana and Chef Yogi, all the way from Fairmont Sanur Beach, Bali, Indonesia here in Kolkata and the lucky foodie People of Kolkata now can taste the excuisite Cuisine of Indonesia. I reached there representing Kolkata Food Boggers with lots of excitement and The Executive Chef of Swissotel, Chef Pranay Singh, who greeted me at the door. He was super excited and happy about the fact that he could have finally brought these Indonesian chefs and Indonesian food to Kolkata. He shared many vital facts about Balinese cuisine. Mr. Marco Saxer, General manager of Swissotel also mentioned, "Balinese Cuisine is new to the city and I am sure that the guests will have the chance to learn more about the culture, regional significance and methods of preparation of authentic Balinese food while enjoying the sumptuous festival." 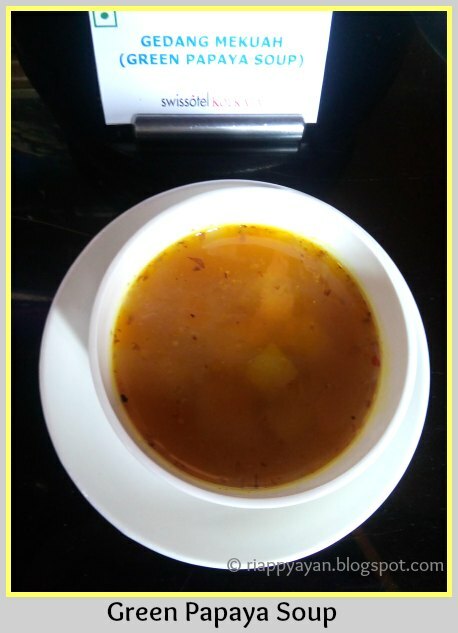 I think it's a great effort from Swissotel to bring such excuisite cuisine to the city of Kolkata. Chef Sugiana is such a humble person and it was a pleasure talking to him and knowing little bit about Bali. He explained to me every dish and even the ingredients he used in there. 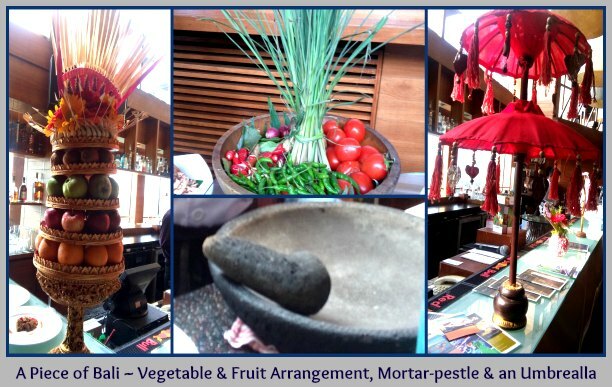 According to him, Bali has strong agricultural traditions in Indonesia and rice is one of their staple food there, accompanied with vegetables, meat and seafood. They have their rice in every meal and one kind of a sticky rice they eat. Pork, chicken, fruit, vegetables and seafood are widely utilized. I was surprised to know that Turmeric is one of the commonly used spice in Balinese Cuisine. Vegetables are also very similar to Bengali cuisine like Green papaya, Long Beans(Barbati in Bengali), brinjal, cabbage are very commonly eaten. They have varieties of spice pastes, used in different preparations which gives distinct flavour to dishes. He brought some specific spice pastes and ingredients like, Pandan Leaves, Galangal, Kaffir Lime and many such ingredients which is vital for Balinese cuisine, all the way from Bali to bring the authentic taste to us and rest he used from here. He even brought his own Mortar and Pestle(Shil-Nora in bengali) from Bali, as Balinese people love to make the spice pastes from fresh ingredients. 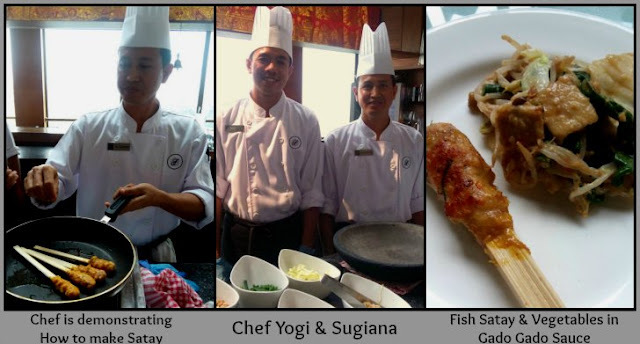 Chef Sugiana and his team even demonstrated live two very popular recipes : Fish Satay and Sauted Vegetables in Gado Gado Sauce. They showed how they make the spice paste in mortar and pestle. Salad(Veg. & Non-veg.) : There are more than 5 varieties of Salads were on display where all has its own distinct flavour. The Executive Chef of Swissotel, Chef Pranay Singh, also shared the fact that, the spread you are seeing here is just for 1 day. Rest of the days of Food festival, there will totally different set of dishes or may be combinations of dishes so that he can also learn as much dishes as possible from those Indonesian Chefs. So, we all can expect many more exciting dishes in this "Balinese Food Festival." The food festival is specially for "Buffet Dinner", available only at "Cafe Swiss", Level 6 of Swissotel, from 7-11 pm from 3rd till 7th March,'16 priced at Rs. 1900 plus taxes per person. 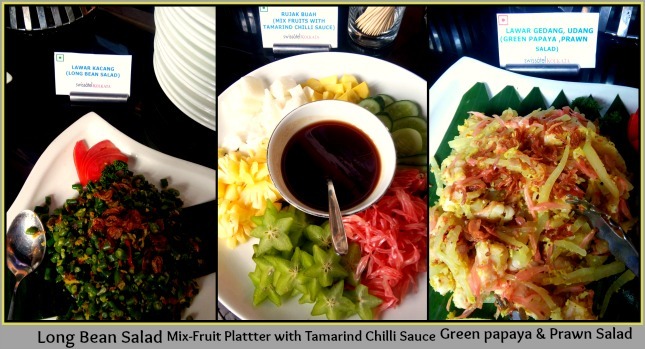 There is also a special themed "Balinese Branch" to be held on 6th March,'16 and is priced at Rs. 1500 plus tax/person for buffet brunch and Rs. 2000 plus tax/person for buffet brunch including beverages. 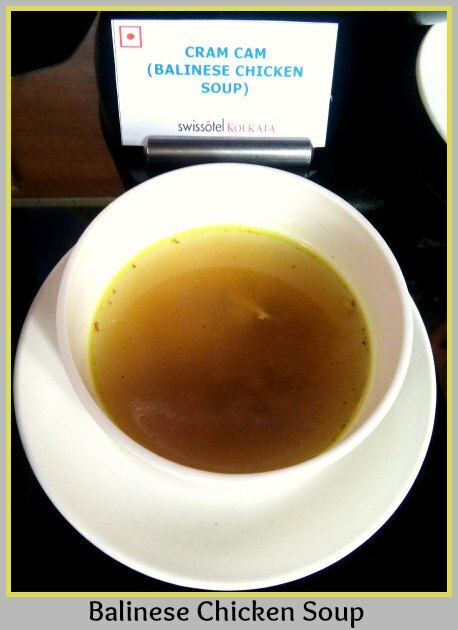 If you are new in the city, You can find Swissotel just beside City Center 2, New Town, Rajarhat.